Back in 2009, I saw an editorial in British Vogue that I fell in love with because I thought the styling was very influential and gave clues to future trends. The model was styled with pastels and neons, bustiers and lace, mixed hard edge jewelry and Creepers with socks. I hadn’t seen Creepers in so long and I loved the way they were styled with the softness of the clothing. There was definitely some “Desperately Seeking Susan” references but mostly the look was fresh. 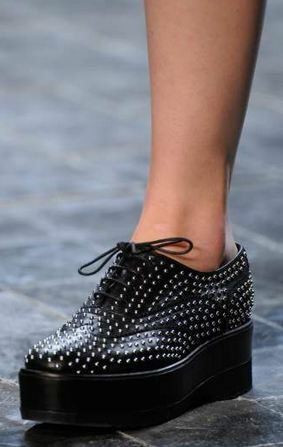 Creepers have been slowly gaining steam as a trend in the past few seasons. 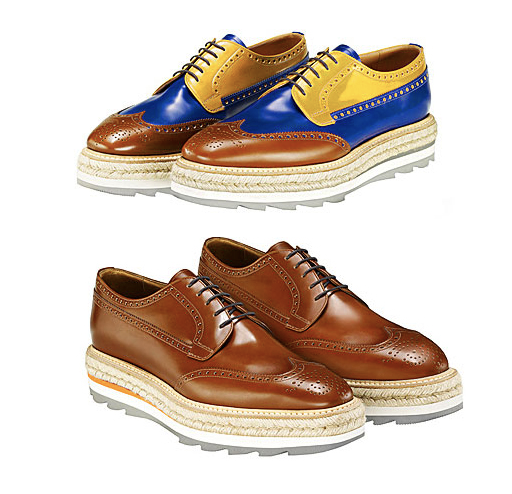 There’s of course the memorable stacked platform oxford creepers from Prada‘s Spring collection as well as the punk inspired Balenciaga during the same season. 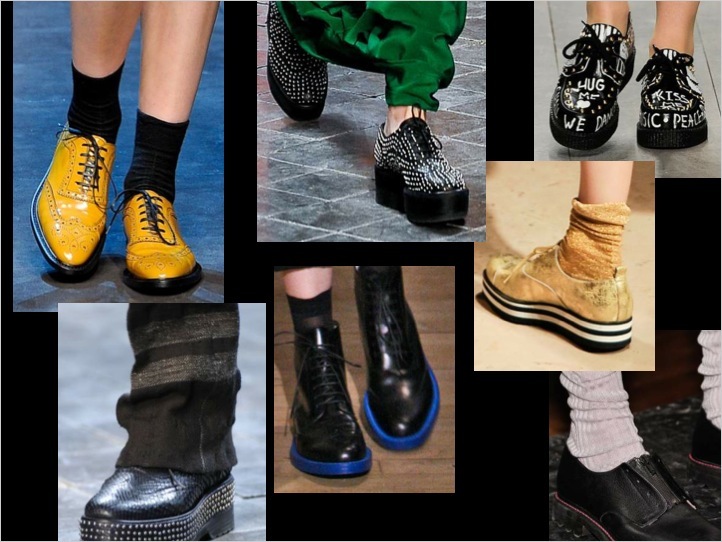 Since then, many different versions of Prada’s Creepers have popped up all over the runways that have a look that combines the leather and laces of a Spectator with the platform height of a Creeper. 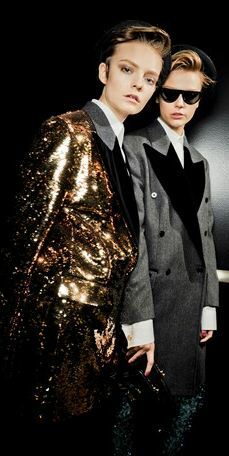 For Fall 2011, Dolce and Gabbana sent “Teddy Boy” looks down the runway and I saw the real versions of the Creepers make an appearance. The hints were starting to roll in, and I had them on the forefront of my mind as a big trend for next year. Coincidentally during my recent travel to Tokyo, I saw a good number of Creepers being worn on the street with all sorts of different styling. 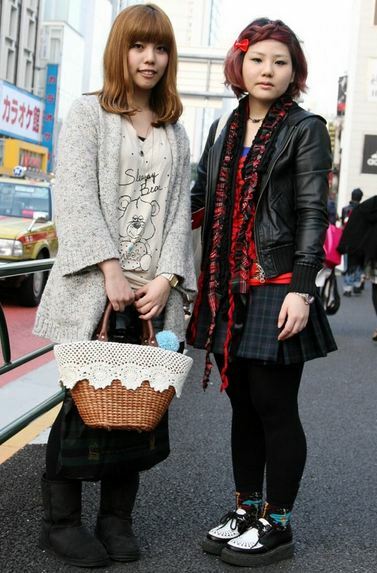 I saw them in Harajuku on the younger kids as well as in high end stores worn by some of Tokyo’s most fashion forward. Creepers were making their mark in Tokyo and it was evident to me that this is a trend that is coming down the pike starting this Fall to go along with Fall’s major menswear theme and the new Teddy Boy influence. Creepers and Teddy Boy goes hand in hand as this particular footwear is the perfect item to complete the refreshed Teddy Boy look. It encapsulates the spirit, the youthfulness, the ever slight rebelliousness along with a sleek sense of style. I found this picture on a street style site and think this girl’s feminine take on the creeper with a hint of boyishness is a good indicator of how this trend will play out stylistically this Fall. And this editorial in Vogue Nippon with Jessica Stem shows how Creepers can be done with today’s rock edge look for a different take. Just for reference, Agyness Deyn has been on the forefront of this trend since she emerged on the scene, emcapsulating the Teddy Boy spirit. This pictures sums it up quite well. And if you can’t find one in the store, just go right onto Ebay. There are hundreds of great options currently available, here are a few notable mentions, and click here to go directly to the page! It makes perfect sense to see this daring and slightly out of the box trend to first take hold in Tokyo and I expect to see them very soon on NY, SF, and LA’s fashion hipsters. Meanwhile, I think Sonia Rykiel, one of my favorite labels, makes the best interpretation for Fall, it’s just the right update on a classic style. And with FNO coming soon on the 8th, it’ll be your perfect opportunity to have a good night out and score yourself a pair for Fall also! Follow The Sche Report on Twitter here!